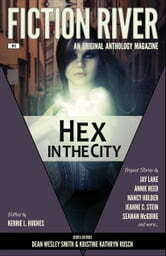 Urban fantasy offers a diverse playground for some extremely powerful stories. Professional writer and editor Kerrie L. Hughes pulled some fantastic tales out of fourteen top writers for this fifth installment of Fiction River. 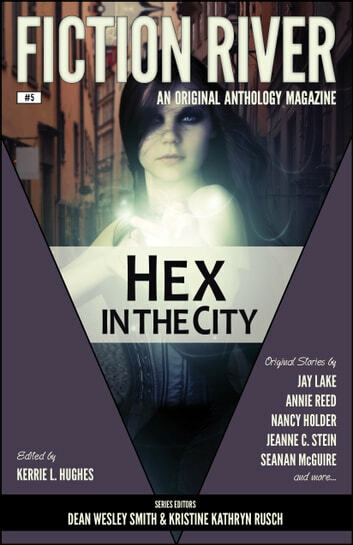 Set in urban lands from modern Portland, to a future Detroit, to a wild Washington, D.C., and ending the tour in London, these top writers take the idea of "Hex" and stretch and twist it into stories with a magickal grip on the imagination. "Fiction River is off to an auspicious start. It's a worthy heir to the original anthology series of the 60s and 70s. ... It's certainly the top anthology of the year to date." "Editor Dean Wesley Smith has compiled an outstanding volume of time travel stories, no two alike. I highly recommend it." "A sugary Christmas treat for those who love romance." "The beloved Victorian Christmas ghost storytelling tradition continues to thrive in modern day, and this multi-genre anthology of short stories is proof. Cuddle up next to a crackling fire with some holiday music playing softly in the background, and lose yourself in eight amazing Christmas stories by a gang of super-talented, cross-genre authors. Not only are they heartwarming, but they incorporate mystery, science fiction, romance and ghosts! A few tend to be more animated than others, but each one is special, and guaranteed to jingle someone's bells." "In this latest volume of an anthology series from WMG's Fiction River imprint, best-selling authors (Mary Jo Putney and Carole Nelson Douglas) and rising stars (M.L. Buchman, Anthea Lawson, and others) present a wide selection of romantic stories, from Regency to romantic suspense to paranormal, all set during the Christmas season and featuring some form of a ghost. VERDICT This title offers eight original love stories that will give romance readers several satisfying happy endings." Fiction River is an original fiction anthology series. Modeled on successful anthology series of the past, from Orbit to Universe to Pulphouse: The Hardback Magazine, the goal of Fiction River is to provide a forum for "original ground-breaking fiction of all genres." Each Fiction River volume will have electronic and trade paperback issues published by WMG Publishing, and will feature some of the best new and established fiction writers in publishing. Dean Wesley Smith and Kristine Kathryn Rusch are award-winning editors, as well as award-winning writers, and will act as series editors for the anthologies. For more information about the authors or Fiction River, go to www.wmgpublishing.com.